Volkswagen has been announced as a sponsor of Australia’s premier endurance race, the Liqui Moly Bathurst 12-Hour. 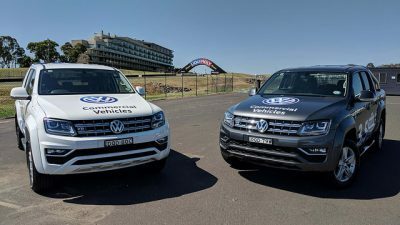 As part of its sponsorship of the Bathurst 12-Hour, Volkswagen’s Amarok V6 will serve as the official recovery vehicle of the race, aiding with the recovery of any vehicles throughout the race. Volkswagen will also bring its one-of-a-kind, track-ready Amarok V6, built by Volkswagen apprentices, to give fans a taste of the power and performance of the Amarok V6 throughout the weekend. The vehicle will perform a number of high-speed, manufacturers’ laps across the weekend. The car made its debut at the World Time Attack event in Sydney last year, lapping Sydney Motorsport Park circuit in under two minutes thanks to a range of performance upgrades to brakes and suspension and a weight reduction process. The vehicle features the standard V6 turbo-diesel engine producing a best-in-class 165kw and a monster 550NM of torque. As part of the challenge set to Volkswagen’s apprentice team building the Amarok, the car lapped the Sydney circuit in a time quicker than a standard Volkswagen Golf GTI, showing the performance potential within the Amarok. The Liqui-Moly Bathurst 12 Hour will be held at Mount Panorama between February 2-4 this year.